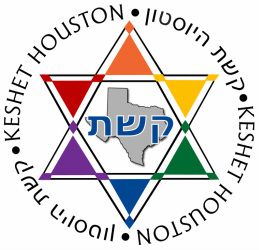 Keshet Houston, Inc., is a nonprofit organization for lesbian and gay Jews in the Houston and Southeast Texas region. "Keshet" means "rainbow" in Hebrew. We organize a variety of social and spiritual activities for our members. Keshet Houston is a 501(c)(3) public charity recognized by the Internal Revenue Service. Donations to Keshet Houston are deductible under 26 USC 170(b)(1)(A)(vi). Strengthening identity and fellowship within the intersection of the Jewish and lesbian and gay communities. Providing a forum in which lesbian and gay Jews can learn and worship together. Acting out the Jewish ideals of צדקה (charity), חסד (loving-kindness), and תיקון עולם‎ (social justice).